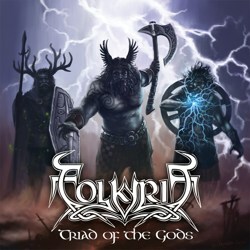 Canadian folk death metallers Folkyria from Quebec City have released their debut EP “Triad of the Gods” on February 26th, 2014. Right now this EP is available only digitally in their official Bandcamp page, but it will soon be released on physical copies for sale too. ”Triad of the Gods” is a work deeply inspired by Celtic mythology, including totally 5 tracks. The beautiful cover artwork is illustrated by Gawyne Li, a friend of the band. Folkyria are already making their plans for their debut full-length album, which should be expected soon. You can listen to the complete EP, following the links below.